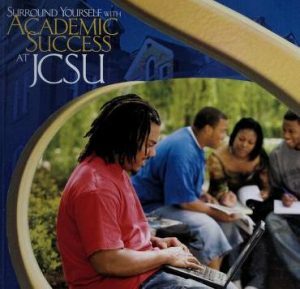 Image from the cover of the 2006-2007 JCSU catalog. 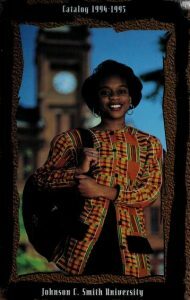 Cover of the 1994-1995 JCSU catalog. A new batch of catalogs from Johnson C. Smith University is now available on DigitalNC. Johnson C. Smith University is a historically black four-year research university located in Charlotte, North Carolina. It was established in 1867 as Biddle Memorial Institute but changed its name to Biddle University in 1876, and to Johnson C. Smith University in 1923. Currently JCSU serves over 1,600 students and offers 24 different undergraduate degree programs and a graduate Master of Social Work degree program. Catalogs in this batch cover two spans of time. The first run of catalogs covers 1878-1909 when the school was Biddle University. The more recent run covers JCSU from 1964-2009. School catalogs include course offerings as well as information such as academic schedules, school history, and more. These newly digitized catalogs join previously digitized JCSU catalogs and bulletins from the 1920s-1960s. In addition to these catalogs, make sure to take a look at other materials from JCSU including yearbooks and maps. To learn more about Johnson C. Smith University, visit their DigitalNC partner page or their website.